Great moments in awkwardness: Skybox opted to take a risk in its 1992 set, selecting a number of players to debut its "Tackling Racial Stereotypes" subset. Things quickly got out of hand. 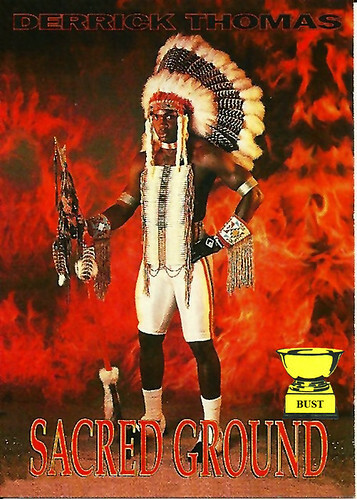 If you think this card is offensive, you should see Atlanta Falcons coach Jerry Glanville's Ku Klux Klan card, Flipper Anderson and Marcus Allen's "Crips vs. Bloods: Battle of L.A." card, or Luis Zendejas wading across the Rio Grande on his card. They even got Steve Young to dress up like a geisha girl, which was just weird.